This is the same famous sound amplification device that has been nationally publicized on TV and in leading publications- similar to those that have been sold in Europe for much, much more. You get more operating time, save money on batteries and help the environment by preventing battery waste. Everyone wins! With 11 hours of charging, you can get 45 hours of continuous use. It can be adjusted to fit whichever ear you prefer. Volume can be adjusted to four different levels. High technology so small fits right behind your ear. Don't be fooled by small size or appearance of this device. It may look like a simple device just designed to hide just right behind your ear, but it's actually a major breakthrough in sound interception and amplification technology. 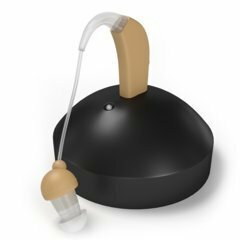 It works incredibly well that you literally won't believe your ears! A New World To Super Ears! Just imagine what would be like to hear sounds that you could never hear before with ordinary hearing. Studies show that there are thousands of different sounds that are not normally audible to the average person. Slip on this technologically advanced device and you'll instantly hear like a super hero. Incredibly, you'll be able to hear people talking in next room loudly and clearly! Take a walk outdoors and you'll hear birds sing like you never heard them sing beforehand hear a deer coming before they hear you, It's an outdoors-man's dream come true! Never Miss A Word! It has a dozen of practical use. Take it to the movies, theater, or lecture hall and you'll never miss a word. It's great for watching TV with a spouse- just keep the volume on low and turn on. She can read while you watch the ball game. It is not intended for the hearing impaired, but now you can enjoy the crisp, clear sound of TV or radio playing on a low level, without annoying everyone else in the room, experience a the fascinating world of super hearing today! Lasts up to 45 hours after one recharging. Includes two styles of ear plugs and three size of each style. If you have any questions about this product by Danny's World, contact us by completing and submitting the form below. If you are looking for a specif part number, please include it with your message.